We’re all guilty of rolling out of bed and straight into the car, train or tube on the last minute, sitting on our bottoms all day at work and trudging back home again. We are so used to all the modern conveniences and when we need some energy we reach for a caffeine boost in the form of a sugary beverage. There are over 10 million office workers in the UK, and although there may be a small percentage that exercise regularly, we really don’t do enough. It’s so easy to stay fit, even when you’re working 8-9 hours a day and commuting to and from your work place. Don’t believe me? Check out Strike Jobs’ guide below! Getting out of bed a little earlier to walk to work instead of climbing into the car again won’t hurt, and will get your heart pumping. Exercise first thing in the morning starts your metabolism running and you are more likely to burn more calories. You might not have to reach for that mid-morning coffee as you’ll be feeling energised from your walk. If you live too far away from work to walk there, then get off the train or tube at an earlier stop and walk the rest of it. If you have a bike then take advantage of that and cycle to work. Some companies have a bike to work scheme, so look into that. A bit of sunlight first thing boosts your Vitamin D levels and is guaranteed to put you in a great mood! Whether you get an hour, half an hour or just ten minutes for your lunch it is possible to squeeze in a little exercise; it doesn’t have to be excessive. If you go out for lunch, then why not visit a café or sandwich shop that is a few streets further away. You never know, you might find a hidden gem! Look for your local park and eat your lunch there. A bit of light yoga on the grass will make you feel fresh for an afternoon in work. Take a group of work mates to the park and have a game of Frisbee. Any fun game that gets you running around would boost your energy levels. Even the smallest adjustments can be beneficial to your health and overall fitness during the day. There are gentle stretches that can be done while sitting at your desk that relieve your muscles. A few examples are: stand up and stretch, shrug your shoulders, point your fingers, make circular motions with your hands and feet. Ensure that your desk, chair and computer are all set up in the best way to avoid strain. 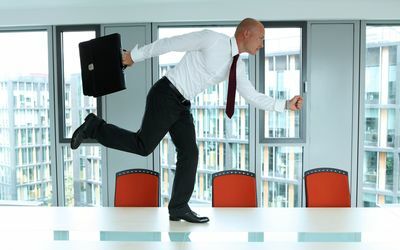 Small breaks away from your desk can be a great chance to exercise, just take a longer walk around the office to the water machine, or pop in the break room for a stretch. If you work in a large building, use a bathroom which is on a different floor and use the stairs instead of the elevator. Some companies, especially the bigger ones, have a work gym. It is recommended that we get at least 30 minutes of exercise per day, so why not add a half hour work out into your work day. If you’re at the office all day with the gym staring at you I’m sure you’ll feel more encouraged to go! And a half hour work out at the start or end of the day will energise you, doesn’t take too much time out of your day and you will start to see your fitness increase. Boredom and tiredness leads to us grabbing naughty snacks at our desk. It is so easy to mindlessly much through an entire bag of sweets or glug down cup after cup of coffee while we type away, but we must stop! Avoid bringing in sweets, crisps and chocolate so that you don’t feel tempted to eat them. Bring in fruit, nuts, low fat yoghurt and other healthy snacks. Natural energy is the best instead of consuming empty calories that leave you craving more sugar just hours later. According to studies a lack of sleep causes us to crave junk food! Sleep deprived brains do not make good decisions and are more attracted to unhealthy food. When we are tired we also eat more. We look for energy to keep us awake, and as a result we consume more. Adults require anything between seven and a half and nine hours sleep per night to function well the next day. However, this varies from person to person. As you can see above, they are so many small steps you can take to boost your fitness levels during the day. If you make these small changes every day you will get into a routine and feel so much more energised during the day. When your co-workers start complimenting you on how svelte you look you can thank me! This entry was posted in General Posts and tagged advise, customer, exercise, exercise help, fitness, fitness blog, general fitness, gym, health, health and fitness, healthy, healthy food, healthy lifestyle, hints and tips, improve fitness, improve health, job board, Jobs, keep fit, lifestyle, online job boards, services, sleep, snacking, snacks, social, strike, strike-jobs, Strike-Jobs.co.uk, work. Bookmark the permalink.